The logo for Vector Surveying Services, LLC. Professional Surveyors are the stewards of the nation's property boundaries and Vector Surveying Services LLC is Northern Ohio's premier professional land surveying firm. Let our team give you a free estimate for boundary retracements, lot splits, ALTA surveys, consolidation surveys, or elevation certificates! 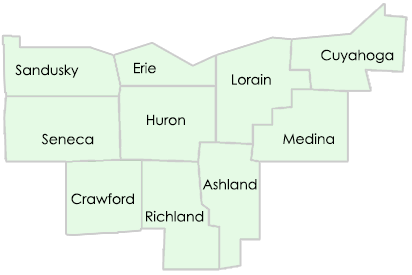 Vector Surveying Services, LLC is proud to offer land surveying services in Lorain, Erie, Huron and surrounding Northern Ohio counties. Our professional surveyors are licensed by the state of Ohio to perform boundary retracements, lot splits, ALTA surveys, consolidation surveys, elevation certificates, construction staking, and a number of other property mapping services. "Tim provides very good customer service and is good with clients. His promptness was greatly appreciated. Would highly recommend." "Tim did an exceptional job for us while surveying our lot. He was very professional and prompt while doing all the work. He kept us informed throughout the process. Even after his work was completed, he answered any and all questions we had. We would highly recommend Vector Surveying to anyone in need of surveying services." "Tim surveyed the property of John Geretz this spring for us. He solved a questionable property line and explained it to us with his expertise. Tim also helped John combine his two lots complete with lawyer assistance and clear directions for John to file with the county. We recommend Vector with complete satisfaction. Thanks Tim!" © Vector Surveying Services, LLC - All Rights Reserved.